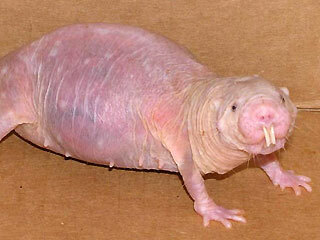 Naked mole rats don't get cancer. They shrug off brushes with acid and age so well, some are older than the college-aged researchers handling them. “They really are from Mars, I think,” said Thomas Park, a professor of biological sciences at the University of Illinois at Chicago. Actually, they’re from the horn of Africa. But naked mole rats are becoming more popular in research laboratories, where the seemingly invulnerable rodents have surprised scientists with their ability to live up to 30 years and their potential to offer insights into human health. They’re being used to study everything from aging to cancer to strokes. Whereas laboratory mice live an average two years, naked mole rats can live up 30 years with little creaking in old age. Buffenstein said their bone quality doesn’t start to diminish until they’re about 24 years old. They look fragile â€” several can fit into a palm, and it’s possible to see beneath their pinkish skin â€” but naked mole rats are like tough, tube-shaped stuntmen. Squirting lemon juice on a cut would sting anyone, but Park said naked mole rats don’t feel pain because they lack a neurotransmitter known as substance P. The discovery has opened up ideas for pain research. Park and researcher John Larson report in next month’s journal NeuroReport that the brains of adult naked mole rats can withstand oxygen depravation for a half-hour or more. That knowledge could eventually help in stroke research, Park said. “It takes time for people to realize that an animal has got a lot going for it,” Buffenstein said. There is a lot of excitement in the medical world about vitamin D as a preventative – or even as a treatment! – for a wide variety of problems, including infectious diseases such as influenza and colds. The basic idea is as follows: Vitamin D is essential for certain parts of the immune system to function properly. The body gets much of its vitamin D from the action of sunlight on the skin. During the fall and winter, most people get too little sunlight exposure and become deficient in vitamin D. Their immunity to flu and colds therefore declines, making them susceptible to flu infections. This is why flu epidemics tend to occur during these months. Epidemiologists have long noticed that flu epidemics don’t follow the patterns expected of a disease that is transmitted simply by the infecting of people who are well by people who are sick (i.e., by people who are coughing, sniffling, and spewing virus-laden fluids). For example, it has been noticed that in the tropics there is no special “flu season”, whereas in temperate regions epidemics occur mainly in the fall and winter. And there are other ways in which actual flu epidemics don’t match their expected behavior. Various explanations have been proposed for these discrepancies. The explanation that appears to make the most sense is the one mentioned above involving vitamin D deficiencies. This explanation accounts for many of features of real epidemics. For example, vitamin D deficiencies are more severe during the fall and winter in temperate regions, but in tropical regions people get good sun exposure all year round, and therefore have no seasonal deficiency. For prevention, at least 5000 i.u. of vitamin D3 per day. To treat an existing flu infection in an adult, 140,000 i.u. of vitamin D3 per day for 7 days. Long-term use of more than 40,000 i.u. per day is unwise because in some people these dosages may cause excess calcium build-up in the body (‘hypercalcemia’). I definitely don’t recommend that vitamin D be substituted for a flu vaccination. They work by different mechanisms and should be seen as complementary preventions. One is a back-up for the other. Flu vaccinations can easily fail to provide adequate protection against fast-mutating flu strains such as Swine Flu or Bird Flu. When these flu strains suddenly become resistant to the current vaccine, there is no time to reformulate the vaccine before a major epidemic occurs. In this case, those who have been taking high-dose vitamin D can have an advantage over everyone else. I always get a flu shot each year, and now I have the extra confidence that comes from having vitamin D protection as well. The U.S. Food and Drug Administration has many critics, but none are more angry than those who have lost loved ones – or who are about to lose their own lives – because the FDA has blocked their access to life-saving treatments. Now these critics have a new and unexpected ally: the United States Navy. For the past four years the U.S. Navy has been trying to gain FDA approval for a clinical trial of a blood substitute being developed by Biopure Corporation. The blood substitute, “Hemopure”, is a fluid containing cell-free hemoglobin extracted from bovine red blood cells, and salts like those found in blood. The FDA has refused to allow these clinical trials, citing safety concerns. Meanwhile, for lack of useable blood or blood substitute, countless people have died before reaching hospitals. The situation is similar to that faced by millions of people with terminal diseases who are unable to obtain potentially life-saving treatments because of FDA nit-picking over clinical data. This agency would prefer to have a hundred thousand people die from not having access to a new treatment than to risk having a hundred people die from potential side effects. Why? Because when a hundred people die from side effects, it makes the news and the FDA gets criticized. When a hundred thousand people die from drug unavailability, nobody pays any attention. During the first decade or so of the AIDS epidemic, tens of thousands of AIDS patients died unnecessarily because of FDA foot-dragging and screwy priorities. The situation hasn’t really improved much since then, judging by this latest flap over blood substitutes. The situation for nutritional supplements is not quite as bad as it is for drugs and other medical treatments – thanks to the Dietary Supplement Health and Education Act of 1994, which has largely protected supplement users from the kind of totalitarian action which the FDA directs at the medical world.5 However, the FDA and its counterparts in other countries have had a basic antipathy toward vitamins and other dietary supplements, and we would all be better off if the next FDA commissioner is someone with a libertarian viewpoint rather than a totalitarian one. The connection between vitamin D deficiency and the risk of acquiring Multiple Sclerosis was discovered more than 30 years ago. Scientists had noticed that the incidence of MS correlated positively with geographical latitude and negatively with the amount of vitamin D in the diet. The latitude effect was also explainable in terms of vitamin D, since the body synthesizes vitamin D in the skin in response to sunlight, which is more plentiful near the equator than at higher latitudes. Since then, almost 200 medical research articles have been published on the subject. The correlation is firmly established, and studies of vitamin D usage have shown that supplementation leads to MS prevention and to fewer MS relapses. It would make sense, then, for vitamin D to be widely promoted for MS prevention. Supplement companies in the U.S. are forbidden by U.S. Food and Drug Administration to promote vitamins for disease prevention, regardless of how effective they are. But what have the medical profession and government health agencies done to promote vitamin D for MS prevention? Essentially nothing. In fact, they have in effect discouraged it. After 30 years of accumulating evidence that vitamin D is an effective preventative and treatment for MS, we still have medical people making statements in the media such as “There’s not enough evidence yet to recommend that…”; and the U.S. government’s recommended RDA for vitamin D has been too low by at least a factor of 20!2 Is it any wonder that some observers consider the government to be actively working to harm the public health rather than to improve it? The latest news about vitamin D and MS sheds some light on how this vitamin works at the molecular level. Researchers have identified a gene that is associated with the risk of acquiring MS, and have shown that vitamin D influences the activity of this gene. The pieces of the puzzle are falling into place nicely, and there’s no reason to delay making use of our knowledge. A little over 25 years ago a paper got published in the journal Science showing that BHT (Butylated hydroxytoluene), a common food preservative, could inactivate herpes simplex and other lipid-coated viruses in lab dishes. Two years later another paper in the same journal reported similar results, but this time in live animals dietary BHT could prevent chickens from dying of Newcastle disease. Like herpes simplex, NDV (the virus that causes Newcastle disease) is lipid-enveloped, i.e., its nucleic acid core is sheathed in a fatty membrane. Viruses of this type require an intact membrane to be infective. BHT seems to work against such viruses by disrupting (“fluidizing”) their viral membranes. If our diet consisted exclusively of foods containing BHT as a preservative (such as some breakfast cereals, potato flakes, chewing gum, and certain baked goods made with shortening), we’d probably get enough BHT to ward off herpes or mumps and measles for that matter. But we don’t. Most of our diets tend to be more varied than that and, besides, in recent years we’ve all been conditioned to avoid food additives. The other option for getting enough dietary BHT is to consume it as a food supplement, a controversial proposition at best because it isn’t a nutrient it’s a synthetic antioxidant. Nevertheless, this is precisely what some pioneering life-extensionists did in the late 70s. Inspired by early scientific reports on the antiviral activity of BHT, a number of people suffering from herpes began to experiment on themselves. As described in several books published a few years later, the BHT experimenters discovered that a daily dose of 250 to 1000 mg resulted in rapid recovery from herpes eruptions with no recurrences. This figure is in good agreement with the estimate based on the chicken study above. In addition to these anecdotal reports, a number of studies published over the years have confirmed the activity of BHT against many different human and animal viruses, including such members of the herpes family as CMV or cytomegalovirus and pseudorabies as well as genital herpes. BHT has been shown to inhibit infectivity of HIV, the AIDS virus, although contradictory results have also been reported. Several studies have revealed a protective effect of BHT against the development of influenza infection as well. The mechanism involved may have to do with the fact that BHT is a highly potent, membrane-active antioxidant as well as a membrane fluidizer. It’s known that reactive oxygen species (ROS) play a role in the pathogenesis of viral infections including RNA viruses such as influenza, DNA viruses such as hepatitis B, and retroviruses such as HIV and it’s been suggested that antioxidants may be useful as therapeutic agents in such infections. In the past, safety concerns have been sometimes raised about BHT because of its reputed toxicity when given to rats in massive doses – doses much larger than those usually consumed for their antiviral effect. On the other hand, 25 years is long enough for any adverse effects as well as positive benefits to have shown up in humans. Many individuals including my friend Roger, whom I’ve known since high school have been supplementing with BHT on a regular basis for years at a time. Roger looks pretty healthy to me these days, but I phoned him anyway to press him for details on his BHT experience. Roger first began taking BHT in 1984 after reading about it in Pearson and Shaw’s groundbreaking book “Life Extension: A Practical Scientific Approach.” Initially he took about 1 gram per day because he was buying BHT in bulk at the time and larger amounts were easier to measure out than smaller ones. Later he was able to obtain BHT in capsules containing 250 mg per cap, and from that point on he took 250 mg every day for 6 to 7 years. Not surprisingly, during this period he remained completely free of herpes eruptions. More surprising is that he still remains herpes-free to this day, 19 years after his last dose of BHT. Around 6 years ago Roger had a comprehensive physical exam, including blood work. His physician told him that no antibodies to the herpes simplex virus could be found in his system. Of course, a sample of one doesn’t constitute much of a survey. I needed to consult a larger database, so I turned to Steven Fowkes, resident guru at the Cognitive Enhancement Research Institute (www.CERI.com) in Menlo Park, California and co-author of Wipe Out Herpes with BHT. Steve, by the way, is working on an updated version of his 1983 book.